During the Napoleonic Wars, both Britain and France regularly seized American ships bound for the other's ports in hopes of hindering the other's economic success. So, in December of 1807, Jefferson signed The Embargo Act. This act banned foreign trade of any kind in hopes that Britain and France would be so utterly wounded by this trade loss, that they would have to accept U.S. neutrality on the seas. This did not happen, and forced to rely only on domestic goods, U.S. prices skyrocketed, crippling the economy, all without restoring trade neutrality. 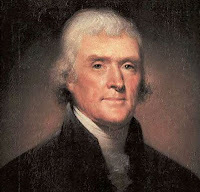 Shortly before the end of his term, Jefferson repealed this act, and limited this trade ban to only Britain and France.